Nicole Thomas was a high school standout in Delaware. She started pitching varsity as an 8th grader. She was part of the 1999, 2000, and 2001 High State Championship team for Delaware. She was voted all conference and all state throughout high school. She went on to play for both Morehead State University as well at Wilmington University. At Wilmington University she was voted first team all-conference as well as team captain and MVP for 3 years in a row. After college she started giving pitching lessons and has been working to help children learn for the past 5 years. Finally! Just what the world of pitching needed! My first experience with Denny was actually through one of my students who had gone to see him. When my student came back and started explaining to me the things she was shown I was so excited. Biggest difference between what I was teaching and this was that this was BETTER! I called Denny and he told me to come learn. Anyone that knows Denny knows he is so passionate about helping others and teaching “fluid dynamics”. I think that is what sets him apart from others. Denny is always working and learning ways to better what he is doing. I was blown away within 10 minutes of watching him teach. Everything just made so much sense. My next thought was I wish I could have learned this when I was pitching. As a former Division I pitcher I was introduced to a lot of styles and techniques with pitching, none of them stood out to me as much as this style has. Every time I left a training event I could not wait to get back and continue to learn. Each time I left understanding more. The level of research Denny has done, and continues to do, on the biomechanics of the female body is amazing. I never realized how myself and my pitchers did not understand the way in which our bodies worked best. Showing pitchers that they can throw like a girl, not be herky-jerky as I like to call it, and feel effortless when they pitch is so rewarding. The look on their face when it all clicks is priceless. The best part of all of this is being able to give my students something I was not able to get for myself. I have parent after parent telling me their daughters love to practice now, have great confidence, and most importantly see how they are improving. I am now a “fluid dynamics” junky. I cannot wait to learn more as this style continues to grow and evolve. Here is what Denny says about Nicole: Helping Nikki make the transformation to Fluid Dynamics was so much fun. Every step of the way she became more enthused and she called me every day to tell me about exciting new things her students were accomplishing. 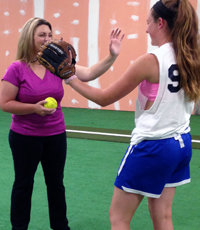 As a former college pitcher, Nikki was able to quickly understand why this approach worked, the advantages it offered, and, she was soon contributing new ideas that helped all of us to get better. She has such a passion for doing things right and toward seeing her pitchers succeed.